MILE 22. (DVD Artwork). ©Universal Home Entertainment. 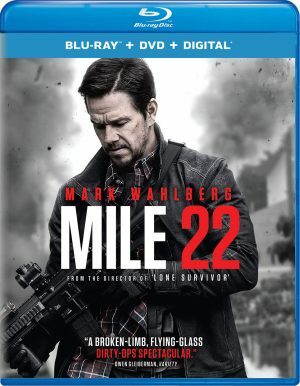 James Silva and his CIA unit embark on a 22-mile gauntlet under deadly circumstances in in the suspenseful action drama “Mile 22,” arriving on Blu-ray Combo Pack, DVD and On Demand Tuesday Nov. 13, from STXfilms and Universal Pictures Home Entertainment. It also is available now on Digital. From acclaimed director Peter Berg (“Lone Survivor,” “Deepwater Horizon”) “Mile 22” stars Mark Wahlberg (“Deepwater Horizon”) along with Lauren Cohan (“The Walking Dead”), Iko Uwais (“The Raid”), Ronda Rousey (“Fast & Furious 7”) and John Malkovich (“Red”). Wahlberg plays James Silva, an operative of the CIA’s most highly-prized and little-known unit. Aided by a top-secret tactical command team, Silva must transport an asset (Uwais) who has vital information to an airfield for extraction before the enemy closes in. The film on Blu-ray, DVD and Digital comes packed with exciting bonus features including a behind-the-scenes look at stunts with actor and stunt choreographer Uwais, a special featurette on the fearless female actresses and more that take audiences deeper into the adrenaline-filled story. Go head-to-head with the largest prehistoric shark to ever exist when “The Meg” arrives on 4K UHD Combo Pack, Blu-ray Combo Pack, DVD Special Edition and Digital. Jason Statham (“Spy,” “The Fate of the Furious,” “The Expendables” films) and award-winning Chinese actress Li Bingbing (“Transformers: Age of Extinction,” “Forbidden Kingdom”) star in the science fiction action thriller, directed by Jon Turteltaub (the “National Treasure” movies). The main cast of “The Meg” includes Rainn Wilson (“The Office”), Ruby Rose (“John Wick: Chapter 2,” “Orange is the New Black”), Winston Chao (“Skiptrace,” “Kabali”), Page Kennedy (“Rush Hour”), Jessica McNamee (“Battle of the Sexes,” “Sirens”), Olafur Darri Olafsson (“The BFG,” “Fantastic Beasts: The Crimes of Grindelwald”), Robert Taylor (“Kong: Skull Island,” “Longmire”), Sophia Cai (“Somewhere Only We Know”), Masi Oka (“Hawaii Five-0,” “Heroes”) and Cliff Curtis (“The Dark Horse,” “Fear the Walking Dead”). Turteltaub directed the film from a screenplay by Dean Georgaris and Jon and Erich Hoeber, based on the best-selling novel “MEG” by Steve Alten. The 4K Ultra HD Blu-ray disc of “The Meg” will feature Dolby Vision HDR that dramatically expands the color palette and contrast range and uses dynamic metadata to automatically optimize the picture for every screen, frame by frame. The 4K Ultra HD Blu-ray disc of “The Meg” will also feature a Dolby Atmos soundtrack remixed specifically for the home theater environment to place and move audio anywhere in the room, including overhead. “The Meg” will also be available on Movies Anywhere. Using the free Movies Anywhere app and website, consumers can access all their eligible movies by connecting their Movies Anywhere account with their participating digital retailer accounts. Fans can also own “The Meg” via purchase from digital retailers. Mike “The Miz” Mizanin returns as Jack Carter, joined by his fellow WWE Superstars Shawn Michaels and Becky Lynch for “The Marine 6: Close Quarters,” the action-packed adventure hitting digital, Blu-ray and DVD on Tuesday, November 13 from Sony Pictures Home Entertainment. Jake Carter and another former Marine, Luke Trapper (Michaels), join forces to rescue a kidnapped girl from a gang of international criminals. The sixth installment in the successful franchise also stars Louisa Connolly-Burnham (“Time Will Tell”), Terence Maynard (“Edge of Tomorrow”) and Tim Woodward (“K-19: The Widowmaker”). From Disney Pixar comes the studio’s latest collection of animated stories, “Pixar Shorts: Volume 3,” featuring 13 shorts including 2016 Oscar-winner “Piper,” 2015 nominee “Sanjay’s Super Team” and last year’s nominee “Lou.” Each short’s filmmaker (or filmmakers) provide a commentary as well as introductions of each one. “Bao” director Domee Shi shares her secret recipe for making an animated short, discussing how her cultural heritage, unique relationship with her mom and her love of food all informed the making of the food-fantasy short film. A featurette called “Caricature: A Horrible Way of Saying ‘I Love You,” reveals how at Pixar, the utmost sign of respect and admiration from their peers is to become a caricature. Take a look at some humorous story artists’ representations of their colleagues. “Puzzle” arrives on DVD and digital Tuesday Nov. 13 from Sony Pictures Home Entertainment. Directed by Academy Award nominated producer Marc Turtletaub (“Little Miss Sunshine”), “Puzzle” is a heartfelt story of a middle-aged wife and mother who finds she has a talent for jigsaw puzzles. This skill leads her on a journey of self-discovery that will change her life forever. The film stars Kelly Macdonald (“Goodbye Christopher Robin,” “Boardwalk Empire”), Irrfan Khan (“Jurassic World,” “The Lunchbox”), David Denman (“Lucky Logan,” “13 Hours”), Bubba Weiler (“The Ranger”), Austin Abrams (“Brad’s Status,” “We Don’t Belong Here”) and Liv Hewson (“The Santa Clarita Diet,” “Before I Fall”). The “Puzzle” DVD includes the featurette “Completing the Puzzle,” in which viewers will step behind the scenes with star Macdonald, director Turtletaub and the cast for an exploration of this complex, moving and engaging story; an insightful commentary by Turtletaub as he reflects on the cast and how his vision for the film was realized; as well as an alternate ending. The third season of the critically acclaimed crime drama series “Narcos” arrives on DVD Tuesday Nov. 13 from Lionsgate. Now that the bloody hunt for Pablo Escobar has ended, the DEA has its sights set on a brand-new target—the Cali Cartel—in “Narcos: Season Three.” Cocaine and the war on drugs move closer to home as the Cali cartel expands its operations inside America’s borders with a dangerous new partner: the Mexican North Valley Cartel. Cali Godfather Gilberto Rodriguez designs an exit strategy that will allow cartel leaders to live happily ever after—but his plans are threatened when someone within his organization teams with DEA agent Pena in the thrilling third season of this acclaimed series. The series stars Damian Alcazar, Francisco Denis (“Tom Clancy’s Jack Ryan,” “The Liberator”), Alberto Ammann, and Pepe Rapazote. Also starring Pedro Pascal (“Game of Thrones,” “Graceland”), “Narcos: Season Three” will be available on DVD for the suggested retail price (SRP) of $19.98. The BAFTA-Award winning BBC comedy and Acorn TV Original “Detectorists: Complete Collection” makes its DVD debut from Acorn TV Tuesday Nov. 13. Mackenzie Crook (“Game of Thrones,” “The Office [UK]”), who also wrote and directed the series, and Toby Jones (“The Hunger Games” films) star as two oddball metal detecting enthusiasts scouring the English countryside for treasure while dealing with their messy personal lives. Rachael Stirling (“The Bletchley Circle”), and her real mother, Diana Rigg (“Game of Thrones,” “Victoria”) also star in the series. The five-disc DVD set features the 18 episodes of three-season series, plus bonus behind-the-scenes featurettes, a Series 2 Christmas special, cast interviews and a photo gallery ($79.99, Amazon.com). “Detectorists” made its U.S. premiere in 2016. The final season premiered in January on Acorn TV as an Acorn TV Original Series. Acorn TV’s development division, Acorn Media Enterprises, co-produced the final season. Follow these two misfit friends and metal-detecting enthusiasts as they scour the English countryside for treasure. Budding archaeologist Andy (Crook) muddles through his relationship with his girlfriend, Becky (Stirling), and struggles to live up to the expectations of her imperious mother (Rigg). Meanwhile, hapless romantic Lance (Jones) flounders in the dating pool until an unexpected person enters his life. But even as their hobby provides them refuge from their everyday problems, it also forces them to contend with rival detectorists clubs, double-crossing acquaintances, and development that threatens their favorite fields. This five-disc DVD set includes all 18 episodes of the series. The bonus features include behind-the-scenes featurettes, a Series 2 Christmas Special episode, cast interviews and more. The international Welsh sensation “Hidden” makes its DVD debut from Acorn TV Tuesday Nov. 13. From the award-winning co-creator and producer of the global hit “Y Gwyll/Hinterland,” the drama series was filmed back-to-back in Welsh and English. Starring Sian Reese-Williams (“Requiem,” “Line of Duty”) as DCI Cadi John as she investigates the death of a woman in her hometown. The three-disc DVD set features eight episodes and a bonus behind-the-scenes featurette ($49.99, Amazon.com). The Welsh version “Craith” premiered on S4C with the English version on BBC One Wales and BBC Four. The English-language version made its U.S. Premiere in July on Acorn TV. After years away from her isolated hometown, DI Cadi John (Reese-Williams) returns to help her sisters care for their ailing father. Paired with the capable but overloaded DS Owen Vaughan (Sion Alun Davies, “35 Diwrnod”), she soon begins investigating a young woman’s suspicious drowning. With bruises on the victim indicating that she was shackled before her death, Cadi realizes that someone is abducting women and holding them captive. When another girl goes missing, the detectives rush to apprehend the culprit before she becomes his next casualty. Through interweaving narratives, this Welsh noir exposes the brutal secrets that lie beneath the surface of small-town life. “Hidden” also stars Rhodri Meilir (“My Family”), Gwyneth Keyworth (“Doctor Thorne,” “Case Histories”), Gillian Elisa (“Stella,” “A Mind to Kill”) and Ian Saynor (“Doctor Who”). The three-disc, eight-episode set is available from retailers for an SRP of $49.99. This week, Front Row Features is giving away two very different—but equally entertaining—films. For moviegoers who prefer action-packed films, we’re giving away a copy of Mark Wahlberg’s latest movie, “Mile 22,” on Blu-ray/DVD Combo Pack to one lucky reader. We’re also giving away a copy of the critically acclaimed drama “Puzzle” on DVD to two lucky readers with a puzzle of the DVD box art for them to work on after the film ends. To enter the contests, simply email socalmovieeditor@aol.com by Nov. 18 with the title of which movie you want to win in the subject line. Good luck! Next PostPhotos: ‘Mile 22,’ ‘Narcos: Season 3,’ Complete ‘Detectorists,’ More on Home Entertainment … Plus Giveaways! ‘Florence Foster Jenkins,’ ‘Ben-Hur,’ ‘Duck Dynasty’ and more on home video … plus a giveaway!